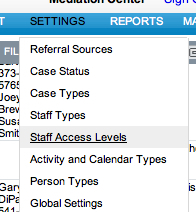 Set access levels by staff type by selecting SETTINGS>Staff Access Levels. 1) In your SETTINGS menu, select Staff Access Levels. 2) Then set the details for each staff access level. 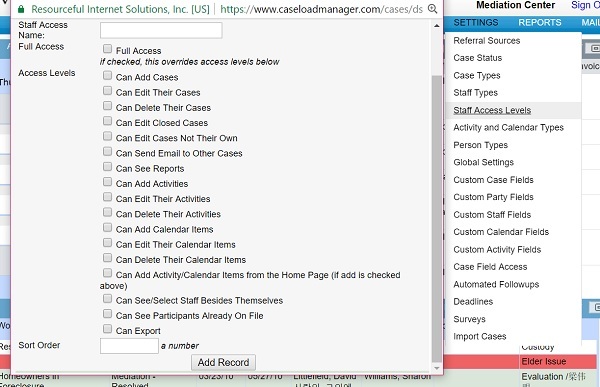 3) For instance, you might want to add a Level entitled "Intern" and then set the individual specifications for Intern as "Can View Calendar Items," and "Can Not Export." **Note that their is a difference between "Full Access" vs. "All Access". Full Access grants the designated staff all the Access Levels in the boxes below and a few other administrative permissions. 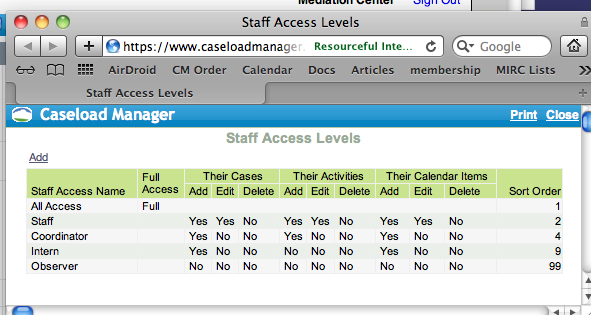 "All Access" has complete access to the entire Caseload Manager system.